In an attempt to keep up with Amazon and their strides towards using drones to deliver packages, Rob Carter, vice president of FedEx, talked about the prospect of using drones as well. Carter pointed out that one of the dangers of moving to drones as a delivery method is the safety concerns. He points out that drones are attractive playthings for dogs and children alike and that certain precautions would have to be taken before drones could safely and reasonably be used. Carter points out that although Amazon uses most mail carriers at the moment, if FedEx can stay on the leading edge of drone availability, Amazon may want to look closer into working with them more heavily. Wildfire emergency responders in california have a tough job without the added hindrance of having to worry about being sued for destroying a bystanders drone while working. That is why Bill 807 was signed into law. This bill allows emergency responders to “take out” drones that are interfering with their work. In the past, drones have held up emergency crews because drones in the air used to mean the emergency aircrafts had to stay grounded. Because drones “pose a potential for crashes and collisions for firefighters” the pilots are now out of a drone as well as being arrested. This doesn’t mean that anyone can take out a drone that is perceived as a hindrance though, as a man in Kentucky is facing a civil lawsuit even though he was cleared of all criminal charges. While some movies are starting to incorporate small drone usage, Liam Young, attempted to film an entire movie with nothing but autonomous drones. The film is a Sci-Fi romance where the drones filming are as much a part of the movie as the actors themselves. To accomplish their goal of filming their movie without ever controlling a drone, Young worked with Belgium’s Embedded and Artificially intelligent Vision Lab in order to program the multitude of cameras to each follow separate yet distinct cinematic rules. The movie will be premiering October 8th in London. Released the Saturday of October 1, 2016, the Iranian Revolutionary Guards presented their new home built drone, named Saegheh, which is a copy of a US drone they captured. After the drone was captured, President Barack Obama asked that Iran give the drone back to who it belongs to (America). Iran believes they deserve the drone though because America should not have spied on Iran with an unmanned aircraft and now America is paying the price. Amir Ali Hajizadeh, head of Revolutionary Guard’s aerospace arm, stated that “This long-range drone is capable of hitting four targets with smart precision-guided bombs with high accuracy,”. This drone is extremely powerful and can be used as a serious weapon which is why Saegheh (name of drone), is something that the American Government will have to watch out for. In response to violence in the neighboring school district, McAllen Independent School District in Texas decided to increase its security through multiple means, including additional fencing around the perimeter of their schools and the use of surveillance drones to assess areas of vulnerability. Along with the new 6 foot high chain link fence, the newly implemented drones will be used to create a closed campus feel with eyes in the sky able to provide a new vantage point of students. With the addition of these two security measures the district will be able to better monitor who is entering and exiting their schools. Uber has been in the forefront of self-driving technology and as of recently they have taken it to the next level. Uber’s head of product, Jeff Holden, has let several websites know that Uber is researching “Vertical takeoff and landing” (VTOL) technology for use in its autonomous taxi drone. Which unlike most drones on the market, does not utilize traditional rotor blades, but instead will have fixed wings and a thrust vectoring engine that is capable of rotating its pitch to provide enough thrust to launch and land. This has the potential to completely change the way people commute in big cities, potentially enabling landings and launches from rooftops. Holden said that this technology could become available within a decade. Aurora Flight Sciences has been in development of a VTOL type combat drone named LightningStrike to be used by the Marine Forces. It has earned the nickname “hairdryer” becauses of its comb like thrust system. With “a turboshaft engine mounted in the fuselage” that “would provide 3 megawatts (4,000 horsepower) of power, the equivalent of an average commercial wind turbine”, this drone has some real power under the hood. John Tylko, Chief Innovation Officer at Aurora, said: “That’s enough to power a small town.” Having that much power in the flight system of the new drone, gives the company great ability to carry a weapons system heavier and more powerful than what has been previously used on drones. Aurora is also in the development of a high powered laser weapons system with a massive 150-kilowatt laser, however the technology is “ten to twenty years off. Due to the fact that the third drone intrusion occurred in two years at the Dubai International Airport, UAE is making the effort to teach drone safety to all people flying drones. The United Arab of Emirates will be passing a new law for the sale and import of drones. The United Arab of Emirates also plans on importing only a certain amount of drones so that way not many people have drones and they are not everywhere. Right now, only 400 people are registered users of drones and the UAE government believes many more people are flying drones and are not registered. Ben Kiff, director of National Air Traffic Control Services for the Middle East, stated that the goal is to teach civilians what the “responsibilities and implications of using drones are, in order to use them safely”. With the United States government worrying about a potential attack on the U.S. power grid by enemy drones, they are trying to install radar-based security systems that are specifically designed to stop drones. One of the main security systems the United States Government is looking at is called SpotterRF, which is a Utah-based company that has a powerful drone defense system. 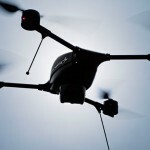 The company claims that their newest radar system can “detect small quadcopter drones at a range of 1,000 meters, providing early detection, tracking, and interdiction against threats to critical infrastructure”. Even though this drone defense technology is available, not everywhere in the US allows it. One of the main concerns some people have with this drone defense equipment is that it is not precise enough which can lead to wildlife being harmed in areas near power grids.